The Osceola photographer presents about his work on Feb. 15, and will ski 80 miles along the river later this month. Osceola photographer Ryan Rodgers does not tire of taking pictures of the St. Croix. He spent two weeks at the Pine Needles cabin as an artist-in-residence last summer, when he shared a post about a day-in-the-life at the cabin. 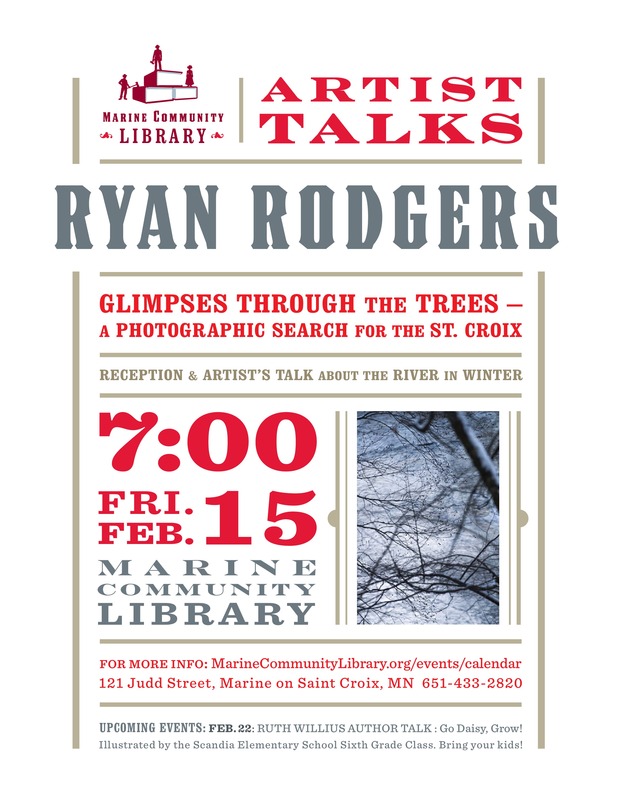 This Friday, he will present about his work at the Marine on St. Croix Community Library during a free event. Details about the event are at the bottom of this post. Read on for an e-mail interview with Ryan, as he talks about his thoughtful approach to photographing his beloved home river. St. Croix 360: You don’t seem to take many of the big river landscape photos that are so tempting. Why not? Ryan Rodgers: You’re referring to the hero shot, the often loosely composed image that implies church bells should be ringing as you look at it. The Saint Croix is a closed landscape. This ain’t the mountains with clean cut lines and massive vertical scale. Most anything done wide here involves great swaths of open sky, and clouds or reflections as filler. The small vertical scale is usually not enough to justify wide shots, and a person can only have so many pretty clouds and reflections. Furthermore, while the sky and water often lack detail, the ubiquitous riverine woods have too much detail. I have a Jim Dimmers painting in my house, a view from the Arcola high bridge. It’s wonderful, with stately pines towering over blurred forests, of which only a few trees are delineated. I could not make a shot anything like that with my camera. It would turn out an ugly mess. Cameras don’t focus like the eye, and when you’re looking at a lovely scene, you’re usually focusing on a specific part of it, and not seeing the whole thing sharply. But back to the hero shot, I don’t trust it. I look at one, and I know the reaction I’m supposed to have (Oh! How grand! How precious! ), and I feel like I’m being led along. The hero shot is too often pretentious, and that means it doesn’t live up to what it claims, which is very un-Midwestern, and un-Saint Croix. The river is lovely, it’s pleasant, but it’s rarely dramatic enough to grip you like the Grand Canyon or Yosemite Valley. That’s what I mean by a closed landscape. You have to work to get inside. And that’s not a dis on the Croix. I love the Croix more than any other place on earth. And if it was coast-ishly gaudy like some 14,000 foot peak or Hollywood starlet, it would be even more developed, and have been shot to death 20 years ago, like the western national parks, or even Lake Superior. SC360: So, how would you describe your photographic focus and why do you choose the subjects you choose? RR: The Type-A explanation is to compile the best collection of Saint Croix Watershed photographs in existence. This is not a weekend project, mind you, this is a long, slow and focused approach, the result of 300 days and counting (since late 2010) spent shooting the watershed. I’ve racked up hundreds of miles paddling, skiing and hiking in the watershed, and here’s where the answer gets more interesting, in attempts to see the river as truly as I can, as my 91 year old grandfather sees the fields he’s been working for 65 years. It’s an approach without an end, a visual essay attempting from every possible angle without ever capturing. Few things please me more than this. Often I’ll go out with a specific subject in mind (usually these are more hero-shot esque), but will often diverge. I want a mix of images, in terms of scale (expansive vista vs. macro), season and place. The best way to put it might be, sometimes you go out with a subject in mind, but mostly you search for evocative and fleeting spontaneous moments. SC360: You became a father about a year ago. Has that changed your perspective on the river and photography at all? RR: Having a baby has made me more focused with time. For instance, during part of last summer the only time I could get out was before my wife went to work in the morning, which was good both because morning is a great time to shoot and I struggle to get up early. I had to plan every location carefully, so that I would have enough time to get there, shoot and be back before 8 a.m.
Plus, I feel guiltier now about wandering aimlessly outside, neglecting my child, which creates increased motivation for more focused work. SC360: You have photographed locations around the world, what makes the St. Croix special from a photographer’s point-of-view? RR: I can see it from my backyard is the lazy answer. But having tried to compile a stellar northwoods collection when I was living in the Cities, I can say it’s key to have quick access to one’s favorite subject. That the Saint Croix has not been photographed to death is huge. SC360: Later this month, you’re planning an 80-mile ski expedition along the river. Can you tell us more about it? RR: It’s more of a micro-expedition. Like photographic compositions, most trips have been done a thousand times, unless you do something crazy like climb Denali in winter solo, or zigzag across the country Forest Gump style. Or, you can do something that makes people say, why bother? I doubt anyone has done this trip before, probably for good reason. The plan is this: my buddy John Schletty and I are going to leave from his house in Saint Croix Falls carrying packs and skis. We’ll take the Ice Age Trail out to River Road, follow the road (or ski the woods) until the road veers away, at which point we’ll head cross country across Wolf Creek and the Trade River (using garbage bags as waders to ford) until hitting the Governor Knowles hiking trail off the end of Evergreen Blvd. The trail will take us all the way to the Grantsburg bridge, on which we’ll cross and head south in MN on the NPS hiking trail up to the Turtle Island Landing. From there we’ll have to do a few miles on roads to avoid private property, but at the northern boundary of Wild River Park a nice expanse of public land begins. We’ll have another road walk back to Taylors Falls, or else a ski on the Indianhead Flowage, though I don’t know how the ice is. If anyone knows one way or another, I’d appreciate info on whether that’s generally safe (ryan@ryan-rodgers.com). I figure it’ll be about 80 miles. We’ll have four days at the end of this month. I’ve hiked 20 mile days lots of times (once 33 miles), but never in the winter. The strip of public land along the river is thin, but fairly continuous, allowing for a trip like this. I imagine at times it’ll feel like being in the wilderness, when in fact a road will probably never be more than a mile or two away. This encapsulates what’s so cool about the Croix, and its fragility, like when you go up in a plane over it and all of a sudden it’s just a tiny wooded fringe surrounded by farms and tract housing, at least along the lower river. Ryan will talk about the character of the river in winter, of frozen backwaters and open forests, of busy parks gone quiet under snow. His talk with explore the nature of the river through anecdotes, slides and perspectives gathered from slow and repeated movement through the watershed in pursuit of images.